BMW did the tuning market a huge favour with this car. At some stage in its development life, they handed the job to a madman, who set about ruining a perfectly good chassis. When our long awaited demonstrator 335i Coupe arrived, whilst we were expecting the trouble inherrent with run-on-flat tyres, we weren't expecting the merely partial improvement having installed "proper" Conti Sport Contact 3 tyres. Yes, the ride quality improved at slow speeds, but the car wanted to get airborne on bumpy roads. We tolerated it for a while, during which we completely converted the car to our B3 specification, and sent it out to the press. Being the first modern BMW to have been offered up with a Quaife ATB limited-slip diff, the press guys were amazed. Chris Harris at Autocar couldn't speak of anything else, and committed it to video in one of his first ever shoots. Evo magazine awarded 5 stars (thanks guys!). When the car had finished its tour with the good people of the press, we started looking again at the chassis. It shouldn't be a surpise for you to learn that we achieved a great deal of improvement after employing chassis Guru, Rhoddy Harvey-Bailey. Our goal was to make the car ride and handle like the E30 M3 or any Lotus. We think we got pretty close, and this development has spawned a whole raft of suspension systems, namely our B-Series suspension. 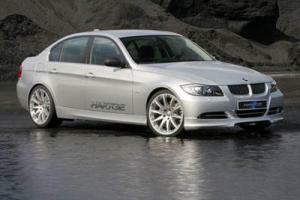 Bob Harper of BMWCar magazine even admitted "Ride quality that is streets ahead of any other E92 we have driven".